You ain’t in the South if someone ain’t offered you some greens! This traditional New Years Day dish caught on across the south for its hearty flavor and ability to pair well with any meal. 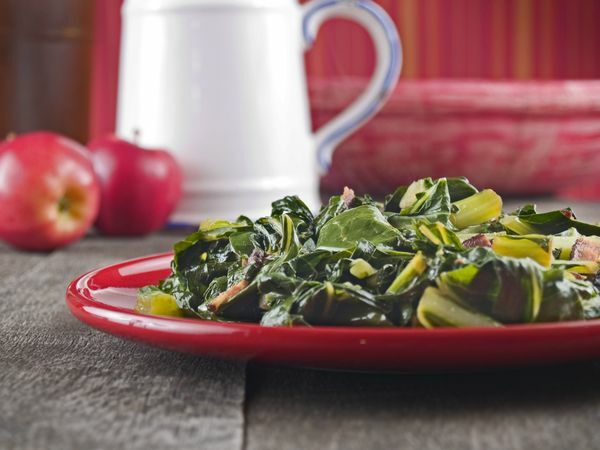 The collard is a large, edible leaf that is often cooked with salted meats, onions, and occasionally turnips or other roots. Scroll down to learn more about our favorite way to cook it up. And don’t forget the cornbread! Wash the collard greens and remove all the stems that run down the center. Take a large boiling pot and bring three quarts of water to a boil and add the meat, seasoning, and salt. Let the meat/seasoning simmer for the next 75 minutes. Take a handful of greens and stack them on top of each other, then roll them up in to 1/2-inch thick chunks. Place the greens in to the pot vertically, rolled up like this. Let this cook for another 45-60 minutes and stir occasionally. The leaves will naturally spread out. Remove from pot with a spoon or tongs and place in strainer to remove excess liquid, then quickly place in a bowl. Add extra seasoning to taste!